A solo exhibition "Touching by heart" by artist Boris Shchetinkin has opened in the Russian Information and Cultural Center in Baku (RICC). More than 40 works were presented in the exposition. The artist painted on them the urban and rural landscapes of Azerbaijan and Russia, Trend Life reported. In addition, artist presented several portraits of well-known personalities in Azerbaijan and Russia, as well as people close to him. 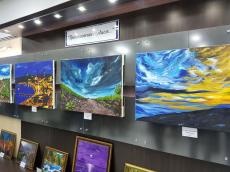 At the opening, the head of the Rossotrudnichestvo representative office in Azerbaijan, Valentin Denisov, noted that the uniqueness of the artist's creativity lies in the fact that he started painting a little over two years ago. The work of Boris Shchetinkin is the work of a bright self-taught artist who, in a short time, achieved interesting and original results. His creative path to painting was long and winding. The artist was born on August 5, 1954 in Baku. In 1976, he graduated from the Azerbaijan Institute of Oil and Chemistry (now Azerbaijan State University of Oil and Industry), having received a specialty of mechanical engineer. After graduating from the institute, he worked 22 years in the specialty. However, Boris Shchetinkin was always connected with creative hobbies and found creative ways of creative self-expression. He has been fond of journalism, sports and theater since his student years, regularly conducts trainings on developing creative thinking for engineers and managers at Azerbaijani enterprises. And, finally, at the age of 61, he came to painting. Having quickly mastered the brush and paint, he created about 70 oil paintings and acrylic for two years. He easily masters the required skills and quickly joined the ranks of original artists, proving that neither age nor absence of special education are problem in order to become an artist.